2 1926 On July 2, 1926, Presbyterian minister Samuel Fisher Tenney died. The father of the founder  Samuel Mills Tenney  of the Historical Foundation of the Presbyterian and Reformed Churches, S. F. Tenney was a champion for Native American, black and women rights, as well as the respected pastor of the Crockett (Texas) Presbyterian Church for 55 years. He founded schools for blacks and indians in Texas, as well as in 1891 led the effort at the General Assembly, which was defeated, to allow women a greater role in the church, but set the agenda for future expansion of women in the church. 6 1743 On July 6, 1743, the first sermon by a Presbyterian minister  William Robinson  was delivered in Hanover County, Virginia. Rev. Robinson had been sent as an evangelist to the colony by the Presbytery of New Castle. Four years later, the Rev. Samuel Davies would establish a permanent church in Hanover. 7 1878 On July 7, 1878, Francis J. Grimke (photo shows him in 1902) was ordained as a Presbyterian minister. Born in 1850 as the son of a white plantation owner and a black slave, Grimke would graduated in 1870 from the first college for blacks in the United States  Lincoln University, founded by Presbyterian Rev. Dr. John Miller Dickey and his wife, Sarah Emlen Cresson. Grimke then studied at Princeton Theological Seminary, graduating in 1878. He was called to Washington's 15th Street Presbyterian Church, which he served for 50 years, except for a brief call to Jacksonville, Florida (1885 - 1889). An articulate opponent of racism  "Race prejudice can't be talked down, it must be lived down"  Rev. Grimke helped in the formation of the NAACP. 8 1933 On July 8, 1933, William Stuart Red (1857-1933) died. A Presbyterian minister and historian, Red was licensed to preach in 1884 and ordained a minister of the Presbyterian Church (US) in 1887. He studied at Princeton Theological Seminary and then attended Columbia Theological Seminary in South Carolina in 1884-85. He served several Presbyterian churches in Texas, as well as editor of the Texas Presbyterian from 1894 to 1897 and moderator of the Synod of Texas (1902). He championed Austin for a seminarian school. His family offerred the land and buildings of Stuart Seminary (a girls school), which they inherited from his mother, to the Texas Synod. In 1902 the Austin Presbyterian Theological Seminary opened at the former girls' school. Reverend Red also worked with Rev. Samuel M. Tenney to establish a center for historical research, which became the Historical Foundation of the Presbyterian and Reformed Churches at Montreat, North Carolina. 10 1888 On July 10, 1888, Toyohiko Kagawa (shown) was born in Kobe, Japan. Under the influence of Presbyterian missionaries  Harry W. Myers and Charles A. Logan of the Presbyterian Church (US), Kagawa became a Christian and studied at the Presbyterian College in Tokyo (1905 - 1908), theology at Kobe Theological University and then at Princeton Theological Seminary (1914 - 1917). He worked in Japanese slums as a Christian missionary and labor organizer. Kagawa also wrote about 150 works. He founded an Anti-War League in Japan during 1928. Kagawa visited the Montreat/Asheville area in 1936. He died on April 23, 1960 and the Emperor posthumously awarded him Japan's highest honor, the Order of the Sacred Treasure. 11 1834 On July 11, 1834, an anti-abolition riot by a thousand people wrecked the interior and windows of the Fourth Presbyterian Church of Newark, New Jersey. The attack was triggered by a sermon on the "sin of slavery" by the church's pastor, the Rev. Dr. William Raymond Weeks. 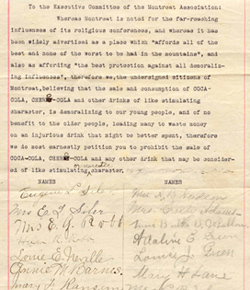 12 1915 On July 12, 1915, the Montreat Retreat Association voted in response to a citizens' petition to make it "unlawful for any person or persons to sell or dispose of any of the following named drinks, Coca Cola, Pepsi Cola, Cherri Cola, Ten-Cola or Christi Cola within the grounds of the Mountain Retreat Association after July 20th, 1915." The penalties were a fine of $25 to $50 for the first offense, and 10 days imprisonment for the second offense. (See petition at right) Coca-Cola and others were under attack for previous rumored use of Coca leaves. Obviously, the marketing of Coca-Cola eventually won over the residents. 13 1853 On July 13, 1853, Presbyterian minister and missionary Cyrus Kingsbury "commenced raising the Presbyterian church in Doaksville (in what is now Oklahoma), after having united in prayer." In 1817, Rev. Kingsbury (shown) started mission work with the Cherokees, and then in 1818 began his work with the Choctaw Indians in Mississippi. When the Indians were forcibly removed to Indian Territory west of the Mississippi River, Kingsbury went with them and re-established a mission of churches and schools. 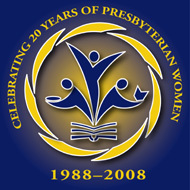 15 1988 On July 15, 1988, the organization called Presbyterian Women was formally created following the 1983 merger of the Northern and Southern churches. The group combined the United Presbyterian Women (UPCUSA) and Women of the Church (PCUS). On July 16, 1740, the Rev. James Anderson died. Born in 1678, Anderson arrived in Colonial America in 1709, settling in Newcastle, Delaware. He served as supply pastor to Cedar Creek before being called to establish a Presbyterian church in New York City around 1717. In 1726, Rev. Anderson was called to Donegal in Pennsylvania, where he settled for the rest of his life. In 1738, he traveled to Virginia to help establish the formation for Presbyterian churches. 17 1684 On July 17, 1684, Isaac Watts was born in Southampton, England. Known as the "Father of English Hymnody," Watts published his first two song books  Hymns (1707) and Psalms of David (1719). Watts (shown) is credited with writing about 750 hymns. 20 1648 On July 20, 1648, the Westminster Larger Catechism was adopted by the General Assembly of the Church of Scotland at Edinburgh. 21 1875 On July 21, 1875, the San Francisco Bulletin reported that the Presbyterian (Chinese) Mission for Girls (shown), which had been opened less than a year, saw "A large assemblage of American and Chinese friends ... to witness the nuptials of Wonk Peng and Miss Chow Cowk, a pious couple, converted under the ministrations of the officiating clergyman, Rev. J. M. Condit. The services were the usual impressive character of the Presbyterian Church." Photo courtesy of The Bancroft Library, University of California, Berkeley. Louisa M. Woosley, the first woman ordained as a minister in the Cumberland Presbyterian Church in 1889 by the Nolin Presbytery. Her ordination was ordered revoked in 1894, but the Nolin Presbytery refused. She transferred her name to minister in transit, which was the status until 1913 when she was added to the church's ministerial list. She was 90 years old at her death and had spent much time in evangelistic work. 23 1764 On July 23, 1764, the Rev. Gilbert Tennent (shown) died in Philadelphia. He was then pastor of Second Presbyterian Church. Son of the "Log College" founder Rev. William Tennent, Gilbert's sermon "On the Danger of an Unconverted Ministry" help split the Presbyterian Church into the New Side and Old Side (1741 - 1758). Gilbert Tennent later worked to create a reunion. He was born on Feb. 5, 1703 in Northern Ireland. 26 1759 On July 26, 1759, the Rev. Samuel Davies (shown) was inaugurated as president of the College of New Jersey (now Princeton University). 27 1681 On July 27, 1681, the Rev. Donald Cargill was martyred in Edinburgh during the years-long conflict between Scottish Episcopalians and Presbyterians. The Church of Scotland became Presbyterian permanently through the Act of Succession in 1690. 28 1648 On July 28, 1648, the Westminster Shorter Catechism was adopted by the General Assembly of the Church of Scotland at Edinburgh. 28 1881 On July 28, 1881, American Presbyterian theologian John Gresham Machen was born in Baltimore. He led a revolt against modern theology and on June 11, 1936, he and others founded the Presbyterian Church of America in Philadelphia in a split from the Presbyterian Church in the United States of America. A suit by the PC(USA) caused the separated new denomination to rename itself the Orthodox Presbyerian Church in 1939. OPC is a separate denomination from the founding in 1973 of another Presbyterian Church in America. Rev. Machen died on Jan. 1, 1937. © 2017. Presbyterian Heritage Center at Montreat.